This column in the Historical Notes section is dedicated to to the display of some of the Newtown Historical Society's most prized possessions. Since the majority of the artifacts are located in the Matthew Curtiss house at 44 Main Street in Newtown, it is appropriate to start with some background about the house itself. 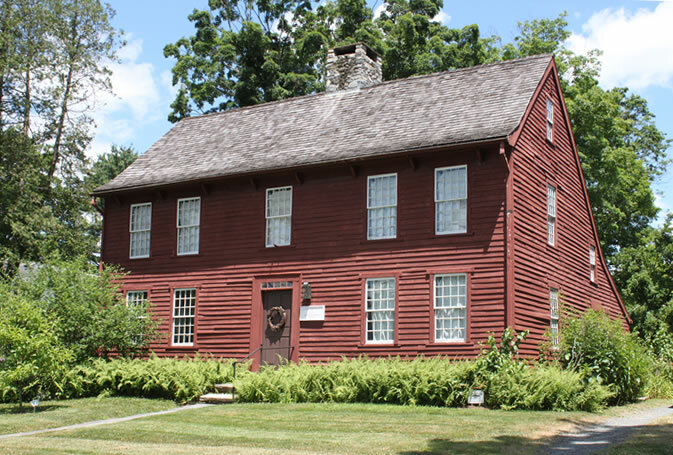 The house was acquired by the Society in 1970 and is a fine example of Connecticut saltbox architecture. The Curtiss House serves as our headquarters and is open to the public as a house-museum. Matthew Curtiss, Jr., purchased the house in 1781. For some time it was believed that he was the house's builder and first resident and thus his name was attached to it. Subsequent research shows that the house was originally constructed about 1750. Curtiss was a Lieutenant in Connecticut's Revolutionary War militia and served Newtown in a number of civil offices, including hay warden, highway supervisor, member of the school committee, grand juror, keeper of the pound and selectman. For a short period he was a partner in a provisions business, dealing mostly in beef. Curtiss sold the house in 1807, but may have continued to live there until his death in 1824. Much of the initial restoration of the house was done by members of the Society. Modern features were removed and three fireplaces uncovered, including the rare arched fireplace in the main parlor. Among the most unusual features of the Curtiss House are the large basement fireplace with cupboard built into the chimney stones and meat hooks in the attic which are all that remains of an old smoke oven. The present contents of the house include not only furnishings of the time the house was new but also items of later date which help to tell the history of Newtown. Rooms suggest the way family possessions could have been added as one generation followed another. The house is open for tours by costumed docents one Sunday per month March-June and September-December. Open houses are typically held in conjunction with a living history event. Past demonstrations have included open hearth cooking, candle dipping, spinning and blacksmithing. There is no admission fee. The history of Newtown really begins in 1708, when 36 men petition the colony's General Assembly for permission to settle a town in an area north of Stratford. Although at least seven individuals had been given permission to settle in this area before this date, the 36 "petition proprietors" were really the first settlers of Newtown. The term proprietor had a specific meaning in colonial Connecticut. It defined the inhabitants of a town who owned its common land and were entitled to share in its division when the town chose to put that land into private hands. Having received their charter for settlement, the proprietors chose four men to constitute a Committee for Newtown whose job was to lay out the town. Early in the next year, 1709, a "Town Plat" was established containing a 132 foot wide north-south road (modern Main Street), intersected by a northern and southern Cross Highway (West Street -- Church Hill Road and Route #302-Glover Avenue respectively). Arranged around these three roads, four acre home lots were distributed in 1710 to the individual proprietors, now increased to 48 men. A 49th parcel was reserved for the minister when he was chosen. Coming primarily from the towns of Stratford and Milford, the men were in their late twenties to late thirties. All were farmers and, being second and third generation immigrants from Britain, were finding the coastal areas cramped. They, therefore, moved to the interior where land was more plentiful and larger farms could be built. Most came to their home lots with their families and built houses near the main street, usually a saltbox or at least a one and a half story cottage. In back of their dwelling, a barn and other small outbuildings such as privies, were soon erected, and small gardens were laid out for growing vegetables and herbs. Further back, an orchard was planted. Together the early proprietors and their home lots constituted a compact village carved out of the wilderness. Farming, however, could not be carried out solely on four acre parcels. Many more acres were needed to raise sufficient food crops and cattle fodder necessary to sustain the average farm family The early proprietors were therefore entitled to several other parcels of land. They first received a four acre Meadow Lot located to the south of the village, around Deep Brook. Next, they were entitled to a four acre Pitch, a parcel of land to be turned into crop fields around the edges of the village. Finally, they got a 20 acre division of the land located "in the hills about the town". In addition, as the remaining outlying lands were divided up, each proprietor received his fair and equal share. Thus within two decades after the village was initially laid out, all but a small fraction of its land was divided and in private hands. With land holding so scattered, travel to and from these holdings to utilize them, was obviously difficult. Within a decade of when the village was settled, various proprietors began to move out to their distant holdings. To overcome the sense of isolation derived from leaving the village, several proprietors with land in the same location tended to move out together. As a result, small communities began to form in the outlying areas of the town. One area that was settled away from the village first was Sandy Hook. There, the water power of the Pootatuck River lured several early settlers who were intent on setting up the saw and grist mills which were necessary for the town's continued growth. Although Sandy Hook would not grow dramatically until the industrialization of the mid 19th century, there was a small but important community here within a year of Newtown becoming a town. By looking at when school districts were established, you can get some idea of the rate of diffusion to the other outlying settlements. By 1738, the area around Taunton Lake was large enough to demand its own school. Ten years later the areas of Zoar in the east and Land's End to the north had also prospered and increased in population to the point of needing a school of their own. In 1748, Palestine wanted its own school, and by 1755 Hanover had joined the group. Thus by 1760, there were seven school districts including two in the village itself. By 1794, when school districts were made corporate entities by the state, the number in Newtown had grown to 20. Although the old school districts were abolished in the early 1920's, their names have survived and are still used in designating different areas of the town. The little communities with engaging names such as Dodgingtown, Hattertown, Lake George, and Head O'Meadow are all fossils of the settlement patterns of Newtown's proprietors as well as quaint reminders of our agricultural past.